India is a secular nation. Sadly, India has set a specimen of secularism in crime as well. Remember, the Nirbhaya Case. A crime where four convicts Pawan Gupta, Vinay Sharma, Akshay Thakur and Mukesh Singh of four different castes raped Jyoti on December 16, 2012, in Delhi. The crime occurred 1600 days ago. Do you think this should be a specimen of secularism, no, it was an instance of timidness where four people brutally raped a girl found travelling alone with her friend. Today, the Supreme Court of India pronounced Nirbhaya Case. Though, the justice took a long span of 1600 days in implementation. But ultimately it proved the proverb ‘There is a delay in God’s house, not darkness.’ correct. At that moment, the fifth convict was a minor. He was sent to Juvenile. Today, he is 23 years old. He is working as a cook. The Supreme Court of India has surpassed a historic verdict today by declaring ‘Death to Sentence’ to all the four convicts. The hearing proceeded at 2:03 P.M and the highest justice of India spoke about all the pieces of evidence collected by the police and submitted by the convicts. In spite of this, Jyoti and her friend’s last statement too was a major concern in this case. The Supreme Court told the society, “Nirbhaya case was a tsunami and a harsh resolution was required to bear with this loss”. Jyoti’s mother Asha Devi was extremely happy after listening to this historic verdict. She told, “Her struggle is completed and she will keep on fighting against the wrong”. Jyoti’s father too was happy. In fact, he posed his confidence in the Supreme Court of India. He was sure about the fact; the decision made by the lower courts of India will be in continuation. And, I must say the Supreme Court is actually supreme. Because the judges of The Supreme Court of India didn’t disappoint humanity. In fact, they took a step to bring the faith back. 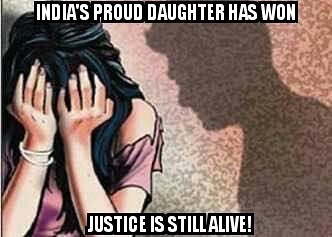 Undoubtedly, India’s daughter is proud of India today. Because she won against all the odds. But her justice is incomplete unto the accuse of the fifth criminal. She preached the society to have faith in God, Judiciary of India. And when God is with you, it doesn’t matter how big the crime is and how huge efforts you make to hide it, you will definitely get justice. It’s really a great justice.